Sassuolo saw their unbeaten run ended by Juventus, but are determined to get right back on track against Empoli. The home side have had a good start to their league campaign sitting in fourth place on seven points. An opening day win at home over Luciano Spalletti’s richly assembled Inter side was followed up by a 2-2 draw away at Cagliari and a 5-3 home win over Genoa. Coach Roberto De Zerbi will be looking to pick up the three points in this game against the newly promoted Tuscan outfit, but might have to do without the services of left back Federico Peluso, who is a slight doubt. The Azzurri on the other hand lost 1-0 to Lazio at home in their last game and that came off the back of a goalless draw away at Chievo. A 2-0 win at home against Cagliari on the opening day was such a strong start, but remains their only win of the season so far. Aurelio Andreazzoli should be hoping to turn the tide in this game and will be looking for his side to start picking up points in matches like these. He will have to do without defenders Lorenzo Polvani who is out for the season and left back Luca Antonelli, while Spanish striker Alejandro Rodriguez is also on the treatment table. Sassuolo are unbeaten at home against Empoli in their last seven meetings, winning six and drawing once. After earning an historic win against Inter, Parma will hope to use that as a springboard as they prepare to host Cagliari on Saturday. The last time Parma managed to beat Inter on home turf was back in 1999, and that result has helped lift the team out of the bottom three – at least for now. However, they will be facing a side who will be feeling increasingly confident after picking up four points against two teams who finished in the top half of the table. Despite their tendency to struggle on the road, Cagliari earned a 1-0 win over Atalanta and now come into this game having drawn Milan at the Sardegna Arena. Their surprise away win has helped boost their standing in the table and they are going to be facing a team who will be brimming with confidence after a very impressive away result last weekend. Despite Cagliari’s win over Atalanta recently, the Rossoblu have lost five of their last seven away fixtures overall. SPAL are surprisingly second in Serie A and visit another side punching above their weight in on-form Fiorentina. La Viola had a big statement win on the opening day, a hard-fought draw at one of Serie A’s toughest stadiums against Sampdoria and an unfortunate loss in another fortress at the San Paolo. It’s been a hard start, but La Viola currently reside in fifth place. However, the focus in this game will be on the visitors. Last season SPAL escaped relegation by three points and finished in 17th with 38 points. So far this season they almost have a quarter of that total after four games. In fact, they sit in second place right now, with only reigning champions Juventus ahead of them. These two teams drew 0-0 home and away last season. Following a vital win against Tottenham in the Champions League, Inter will be desperate to finally get their Serie A campaign going against an impressive Sampdoria side. Inter have had a terrible start to the league, winning just once in four attempts including a 1-0 loss at home to Parma in the last game. Sampdoria also had a midweek game, as Fiorentina travelled to the Stadio Luigi Ferraris on Wednesday in a 1-1 draw, rescheduled from August. The result means that Marco Giampaolo’s men are unbeaten in three games, after beating Napoli 3-0 at home and thrashing Frosinone 5-0 at the Stadio Benito Stirpe. The last goalless draw between Sampdoria and Inter at Marassi was in 1995, so the game promises plenty of action and it wouldn’t be surprising to see both teams scoring. The only notable absentee for Sampdoria is Vasco Regini, who is injured, while Danilo D’Ambrosio returns for Inter and is expected to start at right back instead of Milan Skriniar, who deputised in the Italian’s absence against Tottenham, but will be moved to his usual position at the heart of Inter’s defence. Lautaro Martinez is still recovering from an injury, so Icardi will lead the attack, after Spalleti’s experiment with Keita Balde up front failed miserably against Parma. Napoli really need to start finding another gear in Serie A and Europe with a trip to Torino and their old Coach Walter Mazzarri. The Partenopei will be looking to solve their finishing woes and get an important win on the road following a frustrating draw against Red Star Belgrade in the Champions League, while Il Toro will attempt to capitalize on their recent good run of form. Mazzarri’s side are coming off a 1-1 draw away at Udinese, a match in which they made their second comeback of the season. Napoli’s last Serie A match saw them grind out a 1-0 win over Fiorentina. It was far from convincing, but a definite step forward from the 3-0 thrashing at Sampdoria. In truth, none of Napoli’s performances this season have been particularly convincing, including the victories. Torino haven’t beaten Napoli since March 2015, managing just one point from their last six meetings. After a dismal display against Real Madrid midweek, Roma will be looking to get back on track against deeply troubled Bologna that still haven’t found the net in Serie A this season and hold a single point, obtained through a goalless stalemate with new boys Frosinone. The only saving grace for Filippo Inzaghi’s men is that Frosinone have somehow managed to be worse and Chievo were docked three points. It gets a little worse for the home side when Erick Pulgar’s three-match ban is considered. The Chile international saw red at the 97th minute after a horror tackle on Romulo in last week’s 1-0 loss to Genoa. Lukasz Skorupski and Mattia Destro will be particularly eager to make a good impression against their former club. Rodrigo Palacio, Filip Helander, Godfred Donsah and Neuhen Paz are still out of action. Roma meanwhile will only be missing creative spark Javier Pastore, although the Argentine’s indifferent early season form means he may have not been guaranteed a starting spot anyway. The last time Bologna beat Roma was a 3-2 Olimpico thriller in September 2012, followed by four draws and five losses. The most recent home victory was 3-1 in September 2004. Chievo will host Udinese at the Stadio Mar’Antonio on Sunday hoping to get their first three points of the season. Lorenzo Danna’s men have drawn their last two games including a 2-2 come-back draw away to Roma in their last game, a result that should surely boost their confidence going into Sunday’s game. For Udinese, they have endured a fairly good start to the season, losing only one of their first four games this season. The loss came away to in-form Fiorentina on match-day two, a result that should have nothing to be ashamed of. Udinese go into the game without victory over Chievo since November 2015 when the Zebretta won 3-2 away from home. The reverse fixture ended one all last season. Lazio are still a very long way from the sparkling side we saw last season and Genoa could fancy themselves capable of an upset. Simone Inzaghi’s men still haven’t fully metabolised the drama of missing out on the Champions League in that final day defeat to Inter. Although they have won three in a row now between Serie A and the Europa League, they were scraped results with poor finishing and shocking defending. Senad Lulic’s extraordinary miss in front of an open goal in Thursday’s 2-1 victory over Apollon Limassol reflected their moment – desperately lacking in confidence. There are some injury concerns too, as Stefan Radu, Luiz Felipe and Jordan Lukaku are out for at least a couple of weeks, limiting Inzaghi’s options in defence. Genoa have had an impressive start to the campaign, beating Empoli and Bologna, while their only defeat was a chaotic 5-3 encounter at Sassuolo. Even at the Mapei Stadium, the Grifone staged a comeback and nearly recovered from that flurry of conceding four in 11 minutes before half-time. Lisandro Lopez and Andrea Favilli are injured, with centre-forward Gianluca Lapadula not 100 per cent fit due to a knock. It means we should see Polish sensation Krzysztof Piatek partnered by Christian Kouame with Goran Pandev in a trequartista role against his old club. The last five meetings between these clubs provided a total of 22 goals. Neither Milan nor Atalanta will be thrilled with the start of their campaigns, but they will both get a chance to start anew on Sunday. The Rossoneri entered the season full of optimism after finally landing the legitimate striker they had been seeking for years and securing the services of Italian youngster Mattia Caldara. 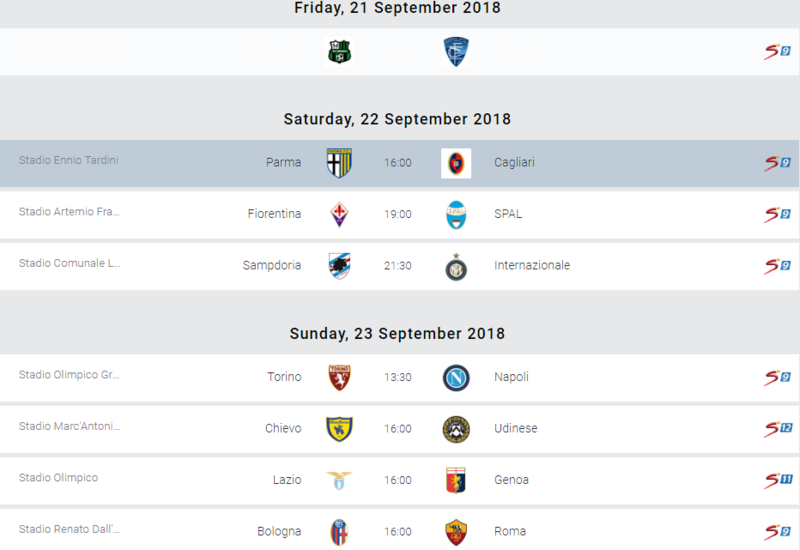 But Gennaro Gattuso’s men have just four points from their opening three matches, and will be looking to turn things around with a big result against the Orobici. While Milan attempt to compete on multiple fronts, Atalanta have had a tough time adjusting to life following their disappointing elimination from the Europa League. They’ve followed up that tough night in Denmark against Copenhagen with consecutive losses to Cagliari and Spal, where Gian Piero Gasperini’s men were kept off the scoresheet on both occasions. Milan have not beaten Atalanta since May 2015, managing four draws and two losses. Their last win over the Orobici at San Siro was back in January 2014. Winless Frosinone take on Juventus on Sunday evening, as the Bianconeri look to continue their perfect start to the new season that has seen them win all their opening four games. The Canarini are in dire straits at the moment, their only point earned was a draw against Bologna in Week 2. They were humiliated 5-0 by Sampdoria, and are yet to score a goal this season. They will be without midfielder Mirko Gori as he recovers from a shoulder injury. Attackers Luca Paganini and Federico Dionisi are still months away with knee injuries, so Stipe Perica and Camillo Ciano are expected to start up front. Juventus come off a controversial 2-1 victory at home over Sassuolo last week, which saw Cristiano Ronaldo break his Serie A duck with a game-winning brace. However, the major talking point from the match was Douglas Costa’s behaviour. The Brazilian was caught spitting on Federico Di Francesco by the VAR officials. He was subsequently sent off, and was given a four-match ban. But that is nothing to take away from Juventus. They have been sensational in the opening four weeks, and they come off a 2-0 midweek win away to Valencia in the Champions League, even while down to 10 men. As earlier mentioned, no team in the league currently has scored more goals than them, and Ronaldo will be looking to add to his Serie A goal tally this weekend. The Bianconeri, however, remain without a number of players through injury. Mattia De Sciglio, Andrea Barzagli and Leonardo Spinazzola are still sidelined, while Sami Khedira went down with a thigh injury after just 23 minutes in Valencia. Frosinone have never beaten Juventus in four meetings, but did manage a 1-1 draw in Turin in September 2015. Their first encounter was in Serie B in October 2006.